If you’re a parent to young children, you’ve undoubtedly heard your little one utter this phrase many times. Plus, it probably most often occurs at some pretty crowded locales such as the grocery store or Toys ‘R Us where the level of parental shame can be at its highest. At such a young age, kids really only have a comprehension of what they want and not what it takes to earn what they want. But that doesn’t have to be the case. Studies have shown that our schools are doing a woefully inadequate job of preparing our young people to be financially wise in their later lives so it’s increasingly on the shoulders of parents to teach their kids fiscal responsibility. With a few simple tools and a little preparation, you too can turn your avid spenders into eager savers. Here are a few ideas that will get you headed down the right track. Kids won’t have a good idea of what to do with money unless they have some so start them with a small weekly or monthly allowance. Birthdays and holidays provide chances for a quick windfall but an allowance will help them understand how to manage a regular “income”. Now that your child has an income stream of their own, don’t hesitate to show them what you do with yours. Explain to them that while you get paid a lot of money (in their eyes, at least), you have to use some of that money to pay for the house, food, clothes, etc. You can use the concept on them in that if they want something like a toy or a shirt they need to use some of their money to pay for it. You have a 401(k) that rewards you (hopefully) with a matching contribution for the amount you save. Why not use the same idea for your kid? For every dollar of their allowance they choose to save, match it with an additional dollar. As your child gets older, you can pare back on the matching contribution you give them as they begin earning their own money and become more independent. Which brings us to…. Your child will soon reach an age where they need to begin to help providing for themselves. If they want a car or an Xbox or anything else, have them save for it so they can at least pay for a good chunk of it themselves. Anything that they pay for with their own money you’ll find them taking a little better care of. Plus, it teaches them the value of working hard to achieve a goal. 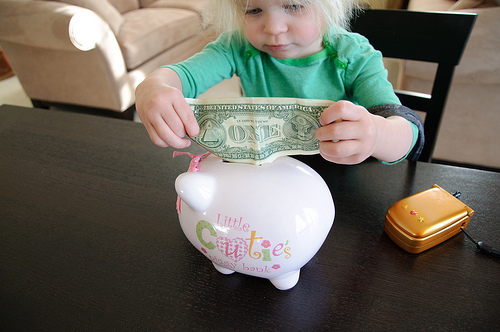 Teaching your child the value of saving versus spending can actually become a fun process. Instead of worrying about trying to head off an argument in the checkout aisle, you can give your child the tools to help them determine for themselves how valuable something is. By encouraging certain behaviors, you can help them learn to separate what they want from what they REALLY want. And those lessons can last years and years. Why are you assuming as the default it should be the school’s responsibility? It’s not increasingly on parents shoulders… it’s always been primarily their job and should be. Your article has some excellent points, but you don’t seem to understand how fiscal responsibility is taught. It is not taught on blackboards or by powerpoint presentations… it is taught by real-time experiences, and they happen almost exclusively outside the classroom (as you described in your article). Also 90% of the education should happen before the child is even old enough to enter school. I’m not sure I agree with this. Schools teach math, english, science and history. Why shouldn’t they teach about money too? I don’t disagree that parents should have a big part of it but is it too much to ask the school system to provide some financial education since that will be such a big part of their adult life? I am a teacher. I do teach money. I teach how much it is worth, how to add it up, how to count your change…etc As a 1st grade teacher I even have “sticker sales” where kids get a dollar worth of coins and can shop for what they want…with fancier stickers being more expensive. However I could never start going into proper ways to invest it (parents would complain). I could never talk too much about saving money…how can you get into that when one kid gets $20 from the toothfairy and another gets 25 cents? At much higher levels some knowledge of the stock market and investing would be nice, but that’s a very small piece of the picture. Teaching investing/frugality is like teaching religion or ethics…if you happen to do a good job of it you are going to have parents complaining and saying it’s not part of the curriculum. Here’s one final way of looking at it. As a teacher, I teach about money everyday. I never give my students anything additional of real value for free. They earn their grades, they earn jobs…etc. I teach by example. How many parents do that? The problem is not that schools are NOT teaching about money… the problem is that many parents are teaching LIES about money…that you can get things for doing nothing or just by asking, or that crying or yelling is more likely to get you things. Young kids’ minds (not babies) are geared to understand the concept of paying for what you want, but some parents sadly unteach that. I do agree that most parents do expect way too much from the teacher to teach kids about money. I am a mom of four girls (9, 5, 2, and a 4 month old) and I do believe that it is my job to teach them the values of money. And as Robert Kiyosaki said in his “Rich Dad Poor Dad” book, the schools don’t really teach kids about finance but if you are a teacher that is teaching them some simple math about money, then that should be it. The rest should be taught by the parents since it is not the teacher’s job to have kids learn about how to invest and such. The teachers can only do so much since they are stuck with kids 8 hours a day. I learned about money mainly from my mom. She would say it even during now, to save as much money as I can. BUt she didn’t teach me about investing which I learned on my own thanks to Robert and many others by books.